It’s been a while since I wrote an update to my “End of 2009 Sojourn” series due to time constraint. Here’s an entry recapping the second day of my sojourn. Tuesday morning, December 29th, began with continental breakfast at the Green Lantern Inn in Carmel, then a two hour trek at the Point Lobos Nature Reserve just a short drive south of Carmel. 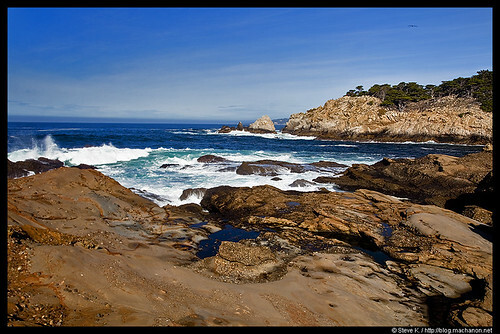 Then following Point Lobos, Shelter Cove, California. A drive that’s approximately 389 miles. Tuesday morning started with a brisk breakfast at the Green Lantern Inn, followed by 2 hours of hiking at the Point Lobos State Reserve just south of Carmel. 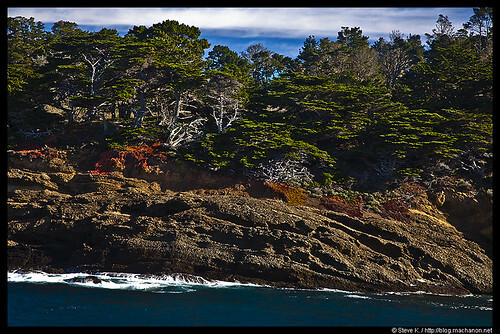 Point Lobos is a nature reserve offering an amalgamation of incredible scenic beauty, archaeological sites, tide pools, beaches, and a plethora of hiking trails. All of which is accompanied by a rich and vibrant pool of wildlife; over 250 different types of fauna and over 350 different types of flora. The trek began at Cypress Cove, looped through Sea Lion’s Point, south to Weston Beach and Hidden Beach and ended at China Cove. Along with the vast tide pools and interesting geological formations, Cypress Cove is home to cliff clinging Monterey Cypress trees. The vibrant arrangements formed by the groves of Monterey Cypress’ cascading formation generates a picturesque scenery of natural delight that only nature is capable of painting. A hike towards the west is greeted by a gradually volumizing mixture of bewildering barking noises and surfs crashing into the rocky shores. We are at Sea Lion Point. 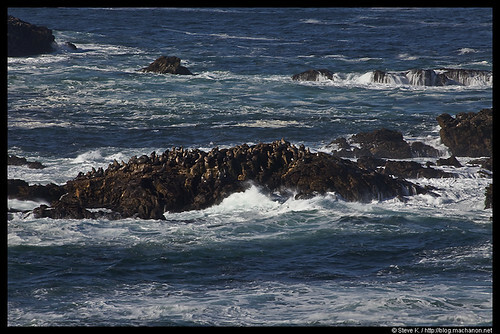 A closer look at the rock formations jutting out of the sea in the distant west reveals a living colony of sea lions. 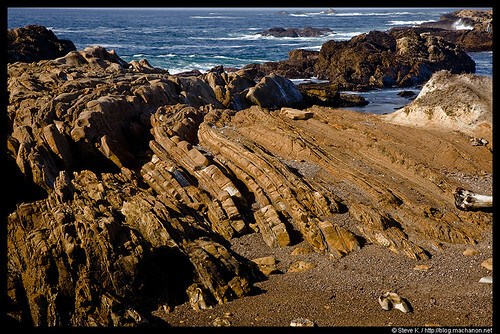 This is Sea Lion Rocks and is the source of the barking from earlier. Sea lions are common within the central coast of California. More-so in the coast of San Simeon. They are best seen in September where large males come ashore to molt their hide. Between December and February, female sea lions come to shore to mate and give birth. Pups born during late December are cared for until April, then are weaned and left behind as the adults return northward. The trek continues south past Weston Beach and a brief stop at Hidden Beach. Hidden Beach provides a scenic gallery of strange and grotesque geological outcroppings and an abundance of tide pools filled with brittle stars, starfish, sea anemones, hermit crabs, shellfish and other shallow water marine creatures. While my meer two hour trek only carved 1/4 of the outer husk of what Point Lobos had to offer, it ended at the splendid China Cove. If the white sandy beaches of China cove is not captivating enough, its glistering icy cold jade-green water surging in and out of a naturally formed cave will mesmerize you. 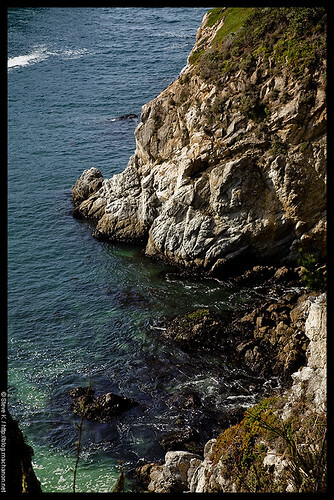 The cave can be entered during low tide by descending a long lichen covered wooden staircase that traverse from the top of the trail to the foot of the shore. While you are enjoying the scenic beauty of the beach from below, a lush green garden of flora follows you along the cliff as you descend or ascend the stairs. I wanted to spend the whole day at Point Lobos and discover all the wonderful delight nature has to offer, but I was on a race against time. Two hours is not nearly enough to spend at the State Reserve. As I packed up and exited Point Lobos, I embarked on a 7 hour grueling drive northward bound, through San Francisco, into the fog and heavy rain of Sonoma County, through Southern Humboldt county and finally reaching my next destination: Shelter Cove.